hen you put criminals in charge of crime, the crime rate rises. The soaring crime statistics which the police are battling began to rise when the psychiatrist and psychologist moved into the field of education and law. It used to be that a crime was a crime. When a police officer did his duty, his duty was done. Now all that has changed. Criminals are “maladjusted” and it is “all society’s fault that they are” and the police officer is a beast for daring to interfere with the poor fellows. 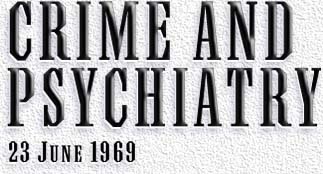 The psychiatrist and psychologist have carefully developed a lawless and irresponsible public attitude toward crime. First and foremost is that man is just a soulless animal who is not answerable for his own acts. They advertise man as a push-button stimulus-response robot and claim that only they know where the buttons are. “Underprivileged” people always become criminals according to these “experts” so the thing to do is make the criminal a privileged being with far more rights than ordinary people. But the main fault to be found with this psychiatric and psychological influence is that these people only escape the hangman’s noose by a fanfare of being above the law themselves. Crimes of extortion, mayhem and murder are done daily by these men in the name of “practice” and “treatment.” There is not one institutional psychiatrist alive who, by ordinary criminal law, could not be arraigned and convicted of extortion, mayhem and murder. Our files are full of evidence on them.